I really love eating fresh, hot muffins for breakfast. This time of year I always have eggnog in the fridge and it’s fun to find new ways to use it in baking. There are all kinds of things you can use it in. I really like the Eggnog Cookies I tried a few years ago. 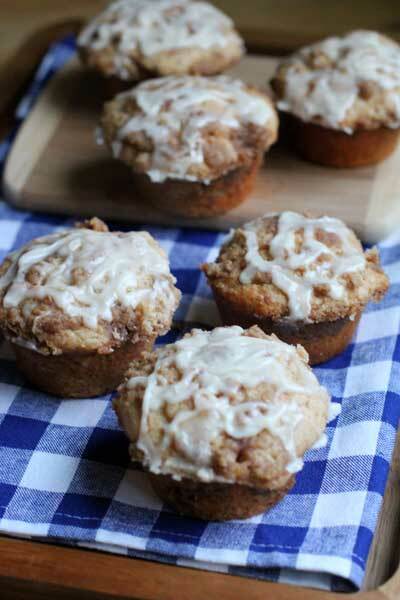 These Eggnog Streusel Muffins are amazing and I plan to make them for a Christmas Eve breakfast for us. These Eggnog Streusel Muffins have a streusel layer in the middle. If you wanted to make this a coffee cake instead of muffins, it would be really easy to convert. The eggnog glaze drizzled over top really makes these special. Preheat your oven to 350 degrees and spray muffin pan with non-stick cooking spray. Make the steusel topping first. Combine the struesel ingredients in a small bowl and mix together with a fork until it resembles crumbs. Next make the muffin batter. In a large bowl, stir together the flour, sugar, baking powder, cinnamon, nutmeg, and salt. Add in eggnog, egg, melted butter, and vanilla. Whisk until the dry and wet ingredients are combined. Careful not to over mix. Batter may have lumps. Place 1 Tbsp muffin batter in each muffin cup and top with 1 tsp of struesel. Add 1-2 Tbsp batter mix on top to cover streusel. Top each muffin cup with remaining streusel. Bake for 20 minutes and let cool to room temperature. While muffins are cooling, whisk together powder sugar and eggnog to make the glaze. Drizzle over the muffins.